The Barham River Flats, situated between Apollo Bay and Marengo, are another feature of the area. They are sparsely covered with vegetation and the Barham River meanders down from the foothills to the ocean. The river flats play an important role as a green wedge and visual separation between Apollo Bay and Marengo. Any development of this land is constrained, as it is low-lying and subject to flooding. Accordingly, Council has placed the area in the appropriate Land Subject to Inundation Overlay. Protect prominent slopes of the foothills and waterway corridors from intensive development and further subdivision and encourage revegetation. Land with environmental constraints. Potential for recreational tourism use subject to investigation. Maintain the sense of a landscape dominated “green break” between the road and the river. 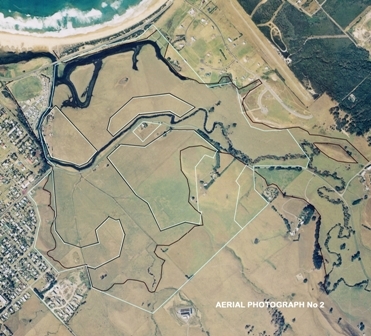 One aspect of the Great Ocean Green development that had wide community support was that it proposed a series of walking trails and revegetation along the river bank. While opponents applauded this, the price to pay was too high. With the situation clarified there is now an opportunity to realise the potential of the Barham River Flats in another way consistent with the implied objectives taken from the Framework Plan mentioned above.